You need some kind of cover for comfortable sleeping during both the summer and winter. Comforters and basic blankets both offer some amount of warmth and security when sleeping, but each type of bed covering is better-suited for specific uses. Before purchasing a new blanket or comforter, consider how and when you'll be using it. 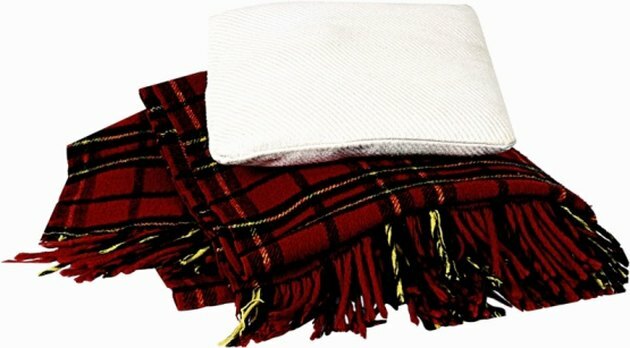 Blankets come in a variety of weights and textures. Comforters, whether they are filled with synthetic batting, goose down or other materials, offer more warmth than regular blankets. A blanket is a single layer of material. Comforters offer at least two layers of thin outer fabric, in addition to inches of insulating filling material. Electric blankets offer much more warmth for winter use, says Overstock.com, but they require an electrical outlet and come with their own set of risks. Blankets that provide enough warmth for use in the winter tend to be made from heavy materials such as wool, while down comforters remain lightweight and keep you just as warm. Climates with distinct summers and winters require the use of different bed coverings during the hot and cold parts of the year. Comforters can be difficult to store due to their thick layers of filling. Blankets are much thinner, making them easy to fold so they take up less space in your closet. You don't want to be stuck sweating under a heat-trapping down comforter in July, just because you don't have room in the linen closet to store it. Even if you need to use multiple wool or fleece blankets in the winter to stay warm, you'll save closet space. The same fluffy batting or down that makes a comforter soft and warm traps dust and gives dust mites a place to live. Allergy sufferers often find themselves sneezing or coughing after a night of sleep with a comforter. Open-weave cotton blankets reduce dust allergy symptoms because the offending particles don't become trapped inside. Electric blankets have been shown to reduce dust mite populations when used for eight hours at a time, according to the experts at the University of Nebraska-Lincoln Extension. If you must use a comforter even though you have dust mite allergies, a zippered cover designed to keep out dust and mites is a necessity. The same batting and filling materials that offer insulation in the winter impede the airflow that keeps you cool in the summer. Loosely woven blankets designed to keep you cool in the summer are also known as thermal blankets, according to the Sierra Trading Post. Even in hot rooms without air conditioning, a thermal blanket will allow your sweat to evaporate as you sleep. The same is not true of most comforters. The additional weight of a comforter also contributes to a smothering or sweltering feeling during hot weather.